A Non-Profit Corporation is a Corporation formed to carry out a charitable, educational, religious, literary or scientific purpose. A Non-Profit can raise funds by receiving public and private grant money and donations from individuals and companies. Non-Profits are exempt from corporate taxation. A Non-Profit is permitted to raise funds by receiving public and private grant money and donations from individuals and companies. 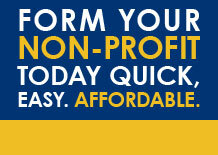 Allows for tax-deductible contributions by donors to Non-Profit Corporations. Non-Profits can be retained and used to pay reasonable salaries. At Laughlin Associates we help your turn your dreams into a reality. When you form a Non-Profit we make it affordable and simple to take your idea and make it a reality.